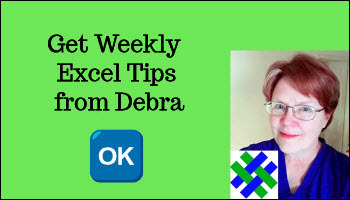 Use a worksheet form for Excel data entry, and the VBA code automatically saves the entry to a list on a different worksheet in the same workbook. Use this worksheet form for Excel data entry, and the following Excel VBA code will save the entry to a list on a different worksheet in the same Excel workbook. The Excel data entry code checks to see if all the input cells have something in them, and displays a message if any values are missing. The date and time is automatically added to column A of the summary sheet and the username (taken from Tools | Options | General tab) is added to column B of the summary sheet. You can change those references to match your input worksheet layout. All the data entry cells that contain constant values are cleared at the end of the code, for the addresses you've specified in the myCopy string. Any cells with formulas are left untouched. MsgBox "Please fill in all the cells!" If you would prefer to view the records on the data entry sheet, instead of going to the database sheet, use Version 2 of the worksheet Data Entry Form. It has navigation arrows added, so you can scroll through the records, to see the data in each one. The navigation buttons take you to the first, previous, next or last record, or type a record number in the yellow cell, to go to a specific record. 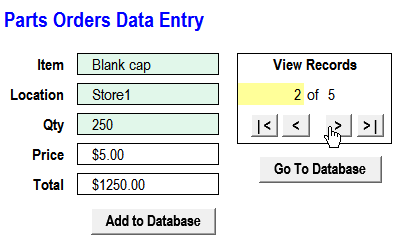 The Go To Database button is still on the worksheet, but you could remove that, and hide the PartsData sheet, so users are less likely to change the data. Variables are set at the top of the macro, and two worksheets will be used -- Input and PartsData. The last row is found on the PartsData sheet (historyWks), and 1 is subtracted (for 1 heading row), to get the last record number (lLastRec). That will be the limit for scrolling down. If lRec is lower than lLastRec, the macro adds 1 to the number in the yellow cell. Then, it finds the applicable row (lRec + 1) on the PartsData sheet, and gets the values from columns 3, 4 and 5, and puts those values in in D5, D7 and D9 on the Input sheet. Original Version: Excel Data Entry Worksheet Form workbook. The zipped workbook contains macro, so be sure to enable macros if you want to test the data entry form. Version 2 - Add/View: Data Entry Form (Add/View) Add new records, and use navigation arrows to scroll through the stored records, and view the data. The zipped workbook contains macro, so be sure to enable macros if you want to test the data entry form.